Liven up your favourite cereal or muesli with this chirpy collection of dried fruits & seeds including; pumpkin seeds, sunflower seeds, linseeds, chopped apricots, sweetened cranberries and sweetened blueberries. Blitz those breakfast blues – scatter these nibbles over your muesli or yogurt. Sunflower Seeds (25%), Diced Apricots (22%) (Dried Apricots, Rice Flour, Preservative: Sulphur Dioxide, Dried Sliced Sugar Infused Cranberries (21%) (Cranberries Sugar, Sunflower Oil), Pumpkin Seeds (15%), Linseed (10%), Sweetened Dried Blueberries (7%) Blueberries, Sucrose, Sunflower Oil). 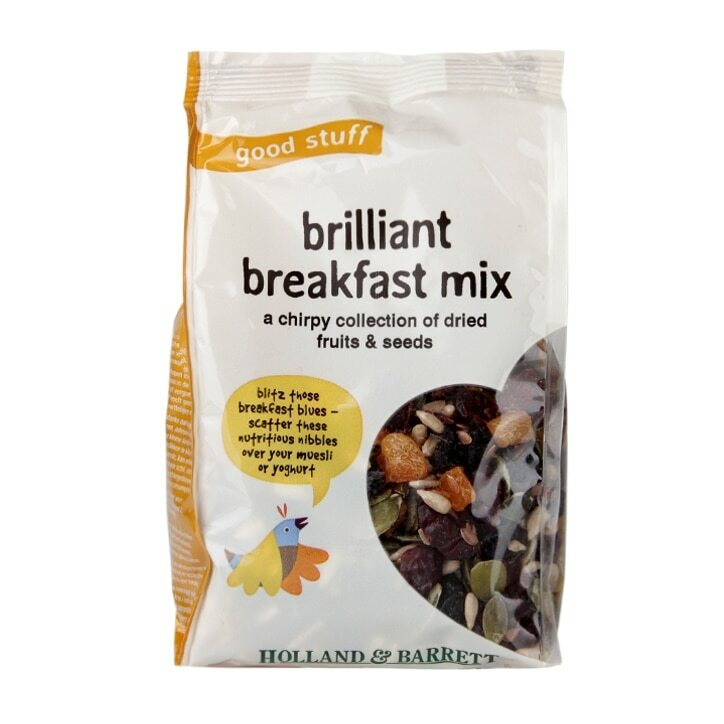 Holland & Barrett Brilliant Breakfast Mix is rated 4.7 out of 5 by 36. Rated 5 out of 5 by Anonymous from Threat mixture of items I bought several packets of these because I had purchased them before. They are delicious sprinkled on my breakfast of either cereal or porridge. Will definitely buy them again. Rated 5 out of 5 by Anonymous from Excellent product! This bag is full of healthy seeds and dried fruits, brilliant for putting on top of porridge or yogurt. I baked a fibre fruit cake and added this mix to it - along with chopped dates and prunes! I will definitely buy again. Rated 5 out of 5 by Veejayess from Liven up your breakfast! This is a great addition to breakfast cereals and I particularly like it added to porridge as it provides texture.